Inspiration and Imagination, two things that every artist needs and is as difficult to find as buried treasure. But once you find it the world is you oyster. Many people have told me that I inspire the children and people in general with what I do. Whether creating art, playing baseball or trying to improve my life, people say that I have inspired others to try new things and look inside themselves. I have always found this interesting because I get my inspiration from these very people. Whether it is a child asking me about Mythology or talking to people about a number of different topics, they have all inspired me to create and use my imagination to bring the impossible to life. A prime example is when I draw the staff at my school as cartoon characters or caricatures. It started one year around Christmas when we have our Christmas concert and staff dinner. Always after the concert, we go out for dinner and we exchange gifts, such as a Chris Kringle. I wanted to liven things up and instead of giving Christmas cards, I decided to create my own with the staff members as a caricature. This specific year I was at teacher’s college and I spent more time with my follow teacher candidates and anyone else. In many ways they inspired me all year-long and that inspiration gave birth some new caricatures. I continued with my favorite style Steampunk. Steampunk is a subgenre of science-fiction and fantasy that came out of literary works such as Jules Vern and H.G. Wells. But Steampunk can be best described by breaking up the word. “Steam” represents the era mostly the early industrial age around the Victorian Era. “Punk” represents rebellion or going against the norm. The “Punk” or rebellion goes for going against what is expected on the technology level as well as societal norms. On the technology level you see cars that are steamed powered, flying dirigibles or airships the size and look of sailing vessels or steam-powered walking machines. Yet when it comes to rebellion on the societal side it affects women the most. During this time women were relegated to subordinates to the men, covering up themselves, not taking up employment or independent behaviour. That is why in Steampunk you will see many women showing cleavage or wearing short skirts and showing a lot of leg to show off their stockings. Between classes, lesson plans work and other things it took quit a while to create the caricatures. But once my fellow teacher candidates received them they loved the cards and caricatures. In the next few weeks I will be posting a few of the characters from the cards because these people inspired me to create these characters on our ‘Journey Together’ through teacher’s college. Hopefully they can spur imagination and inspire others. The caricature is of a person who has a very strong personality and will not back down for anyone. When I began drawing her caricature I envisioned her as an aeronaut, someone who would fly a zeppelin or a dirigible. I began with the traditional leather corset and leather skirt to match. I then wanted her to show some leg and cleavage to show her feminine side while dressing her in black leather boots and gloves for that extra tough side attitude. Then of course I added the multi-round pistol to finish the job. At a function many of us attended we were all well dressed and the theme of the night was based on a James Bond movie Casino Royal. I jokingly gave code names to each of the people. They liked the code names and I added them to the caricatures. Each code name is specific to the person, for example I and code name “The Captain” from my stories and because some said I look like a captain of a ship. For this person I gave her caricature the code name “Slip Steam”. It’s the air driven back by a revolving propeller or jet engine and could be very dangerous to anyone in its path. I thought it a good name for this person for she is a tough and formidable person as well is went with the aeronaut idea. The second caricature is of a person who helped me greatly while I was in teacher’s college. When it comes to research or anything to do with academic work this person is the one to talk to. When I began drawing her caricature I kept this all in mind and the best way to capture this is to draw her as a librarian/adventurer. Very much like the character of Jane in Tarzan; a female scholar that goes into the field for knowledge and adventure. I began with a traditional Victoria dress but I wanted it to be blue to match her eyes. I then added a satchel with inkwells, pencils and erasers. I then placed a pencil in her right hand and a large bound book in her left. She sometimes pulls her hair up and I did the same but I topped it all off with a beautiful Victorian style hat women wore during that time period. Continuing with the code name theme I decided to call her “D. De.” short for “Dewey Decimal” from the “Dewey Decimal System”. The system of categorizing book in a library created by Melvil Dewey. This name goes well with the librarian theme for the caricature and suited caricature very well. Steampunk Woman 02 – Codename D. De. The third caricature is of a person who has a heart of gold and personifies what a teacher should be like. A quiet person but very passionate for her students well being. She is some one you can rely on. When I thought of her caricature my first thoughts went to a Victorian Lady. Yet I know that even though she a lady through and through, she is a force to be reckoned with if the need arises. Therefore I drew her with a sleek long skirt and a blouse but I gave the blouse a low cut to show off her cleavage and then added the leather corset. I then drew in a bullet with a side arm and an adventure belt. Then to finish the ensemble, I drew in a rife-parasol. She maybe be a lady but she packs a punch so don’t mess with her. Continuing with the code name theme I decided to call her “Charade”. This goes with the persona of her sweet calm side but you better watch out, this lady is not one to be messed with. The fourth caricature is of a person who works as hard as anyone I know and loves being with the students. She has a wonderful if a bit quirky personality but is a joy to be around. When I thought of her caricature my first thoughts went to a Victorian Lady but with a bit of an attitude. Therefore I began drawing her in a Victorian dress but I envisioned it as a royal colour such as purple. She has an edge to her so I drew her with an open chest to show some cleavage and a bit of lace around the breasts and under the corset. I then drew a small jacket with purple shear covering her sleeves and chest. I then wanted something different for her hat and hairstyle so I gave her free-flowing hair and a gentleman’s top hat. I finished off the look with an adventure satchel, a pair of goggles that are around her neck, and a rifle-parasol, but in a light purple to match her dress. Continuing with the code name theme I decided to call her “Java”. This comes from a little thing I notice about her. She is always with a coffee. No matter the size, large to extra-large she always has one with her. Therefore I thought of the informal or slang name we give to coffee, java and it seemed appropriate. The fifth caricature is of a person who you want as a teacher and a friend. She is a great person who will always have your back and will be there when you ask. She also has an adventurous spirit, so when I thought of her caricature I kept this in mind. I was thinking of a steampunk-winged character that could come in with an attitude. Therefore I started by drawing her in a fly suit with pants, a leather corset and leather boots and gloves. I then added the bat like wings that would be attached to her back with an apparatus. The wings would be of a canvas or leather combination and with be like a hawk or bat that could fold up and then stretch out in flight. I then drew her hair under an aviators goggles. Because she would be flying I drew her hair a little wild and free, like her. I then added a couple of weapons that she would hold, a small pistol and a large rifle. The colouring for her outfit I used the same colour scheme as Ironman, Red and gold. Continuing with the code name theme I decided to call her “Avenging Angel”. I thought it appropriate with the winged outfit and I know that she is not one to be messed with. The sixth caricature is of a professor from the teacher’s college program. Even though I did not have her for many classes she was a big help in my learning and becoming the teacher I am. Before we started the program we all went to a retreat up north and she was in charge of my group and she was adventurous, insightful, funny and a great person to talk to. I kept all this in mind when I was creating her caricature. The first image that came to me was that of a Victorian Lady. I started with a tight skirt and a puffy shirt that would show a bit of cleavage. I did not add a corset with her caricature yet I added a small hat. The colour of the outfit was very similar to her Halloween costume where she was Audrey Hepburn. Though she would have her hair up most of the time, I drew her with straight hair down. Continuing with the code name theme I decided to call her “E.VE.”. This is a work around her name and I thought EVE went well because we were at the catholic site of the university and it seemed appropriate. Steampunk Woman 06 – Codename E. VE. The seventh caricature is of a person who worked at the teacher’s college site. She may not have been a professor there but without her assistance the program would not run as smoothly as it did. She did everything for the professors and us. From organizing trips to making sure our Christmas social went off without a hitch. She was the grease that kept everything work like a well-oiled machine. For her I imagined her as a sophisticated Victorian Lady. I drew her in a long drew with long-sleeved jacked over her blouse. I added the top hat and drew her hair in a simple style. Yet I did add a rife-parasol for that extra element, she is not one to be messed with. Continuing with the code name theme I decided to call her “RightHand”. As I stated earlier, the Profs and the students could not have done things without her. I essence she was like their right hand. Something and someone many could not do without. The eighth caricature is not just a professor from the teacher’s college program but also the site coordinator. I had her for several classes and she taught and helped me a lot. With her caricature I again thought of a Victorian Lady but I knew she had to be a bit different and wanted to show that she is a person who took risks. Heaven knows that she took a lot of risks with the program and us. Therefore I began by drawing her with a very conservative jacket but it shows a bust outline with a ribbon going down the middle of the chest. I then drew her with a parasol that matched her outfit and adorned with lace indicative to the period. I then added the top hat with a ribbon to match. Her hair and was very similar to her own and I added glasses because she always wore a pair. Yet to show her aspect of taking risks I drew her with a high cut skirt showing a lot of leg and her stockings. It is a bit daring for a woman of the time period and I wanted to show that she is daring. I wanted to be respectful to her and yet show her daring side. I think that I achieved a proper balance. Continuing with the code name theme I decided to call her “Queen Bee”. As I stated earlier, she is the site coordinator for the program, in essence the ‘Big Boss’. What better name could I give but “Queen Bee” to someone who oversees all the rush of action in the program similar to a beehive? The ninth caricature is a professor from the teacher’s college program that I cannot enough about. This professor is the heart and soul of the program. Always with a smile he has a way about him that makes you smile back. His knowledge on teaching is extensive but what really makes him special is his un-denying dedication to the students, both the kids in his class and the teacher candidates. For this person’s caricature I wanted something unique, something I had never done before. One of his greatest passions is setting up the overseas teaching practicum in Africa. It is very much a mission style teaching opportunity that many people look forward to going. With this in mind I began by drawing him as a Victorian Era explorer. It is African inspired therefore his outfit is tanned colour but I also wanted to show that he is a professor of time period. Therefore I drew him with a jacket, shirt and tie, then I added the baggy pants and boots that have his pants wrapped around them. I then added a pith helmet, holster, sword and gentleman’s’ cane. The top of the cane has a jewel with a star inside it very similar to a compass. I then drew in a map that reads “African Star Treasure” in reference to his African practicums he organizes. Also the star in the cane is referred to that too. He does not smoke but what is an English professor without his pipe. Lastly I drew in a small moustache and gold spectacles. Continuing with the code name theme I decided to call him “Professor G”. He is a professor and drawing from Professor X, I decided to call him using his first initial for the letter. When I said out loud, is suited him. The tenth caricature is of a person who has the goodness of what a teacher should be like. She is strong, independent and someone who has your back. When I though of what her caricature should be like the first thing that came to mind is a reporter like Lois Lane. Someone that will look everywhere, go anywhere to get what she wants. I started by drawing a Victorian lady, with a white blouse, corset and a long ruffled skirt. I then added some technology that was appropriate for a reporter. Therefore I drew a clipboard with a mechanical arm that would write what the person had said. To show this I drew in a microphone head that would be attached to her right top of her blouse. Then to show her tough side I placed an automatic pistol in her hand and drew in a holster and gun belt. Yet I still wanted to she that she was feminine, I gave her a large brimmed hat with feathers and lace on the top to go with her long straight hair. Continuing with the code name theme I decided to call her “Pen”. This went well with the journalist theme but ‘pen’ has another meaning. It is also what you would call a female swan. I told her this was because she is a tough woman yet she is also very graceful in what she does. The eleventh caricature is of a person who has a heart of gold and wonderful friend. Her talent is singing and when she does you are transformed to place of such joy. With her caricature I started with a Victorian lady with a full-length skirt, a corset and a puffy shirt that still showed a little cleavage. I then added matching armbands for a fashion statement and a satchel. Then to emphasize her musical talent I added a portable sound system. On her left rear is a speaker with a gauge and in her right hand a microphone. This is all connected to a power source on her right side with a crank and power meter. Something similar to the old style radios or phone that you need crank for power. To top off the caricature I drew her hair straight like hers yet I added a bowler hat with a feather in it for that feminine touch. Continuing with the code name theme I decided to call her “High Note”. As I stated earlier she has a wonderful singing voice and what better code name than that with a musical flare. The twelfth caricature is of a person who is a wonderful friend that is fun to be with and dare I say a bit like myself, a bit of a joker. With her caricature I came up with her code name first “Femme Fatale”. At a function many of us attended, we were all well dressed and the theme of the night was based on a James Bond movie Casino Royal. I jokingly gave code names to each of the people who attended. She was dress in a stunning black dress and the first code name that stuck for her was “Femme Fatale”. She loved the name and it suited her especial with the night’s theme and the amazing dress she was wearing. With her steampunk caricature I knew I needed to really punch up the rishé factor. I started with the corset. I drew it very tight-fitting to accentuate her breasts and waist. I also drew silk frills that would protrude out from the waist and breasts. I then drew her wearing a high cut skirt with two slits that would show off her shapely legs. To enhance her legs I added thigh high stockings with her suspenders showing and of course matching black high heels. I then drew her wearing a leather jacket with fur cuffs and a fur cloak to give her that rebellious look as well as sporting two fast action revolvers. I drew her hair very similar to her own, long and curly. I had it layered and some strands going over one of her eyes in what I call the mysterious look. To add a more personal tough to the caricature, I then drew roses on each of the breast. We both love Disney and ‘Beauty and the Beast’ is our favorite movie. With the three keys dangling from her waist, that is an inside joke between us. I was with this group from almost the beginning of the school year in teacher’s college. We grow, learned together and supported each other throughout the year. It was amazing to be apart of this special group of individuals and I wanted to give them something that they could remember with happy memories of fellowship and a shared experience. 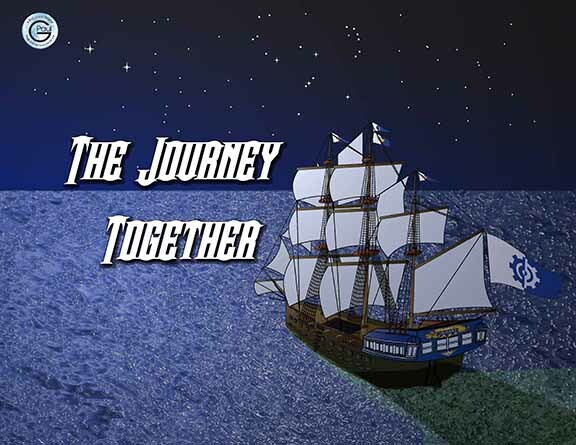 The title The Journey Together is self-explanatory. We journeyed through teacher’s college through the good and bad times. We ended up with a great adventure, tremendous stories and experiences to remember for a lifetime. This group is a bit different. The only student in the group is me, the rest are the professors and administrator at the teacher’s college location. I went to teacher’s college that was centred on Catholic education. We were still part of the university but we were off site at the Catholic Board’s Head office to can help us with one very important aspect of catholic education, community. We were a small tight-knit group that worked on getting our Bachelors of Education and teaching certification, but we had one thing more that bind us together, our faith. This principle was established early on by the professors. They helped to fuse our small group into a community. I know that without their assistance, many others think the same way; I would not have succeeded without their guidance and mentorship. The Journey Together title applies to them greatly because they were there to lead us through all the good and bad times and then ended up as teachers with many happy memories. This group of wonderful people, I connected with them from the very start of the year I was in teacher’s college. In some ways this group inspired all the previous group caricatures. Yet I did not create their caricatures until the end of the school year. Mostly because I was so preoccupied with all the schoolwork, yet I made it a point to give this to them before the end of the school year. Their friendship and help made teacher’s college fun in so many ways. The title The Journey Together is self-explanatory and it fits well for this group. We journeyed through teacher’s college through the good and bad times but we never lost of sense of fun and fellowship. We ended up with a great adventure, tremendous stories and experiences to remember for a lifetime.